reflecta is a German company developing high-quality film and slide scanners since many years. They are still active on the scanner market with lately released devices. With the DigitDia reflecta has introduced the first scanner being capable of directly scanning from a feeder. Using SilverFast's image automatics and Multi-Exposure, the DigitDia is an optimum solution for automatically archiving large collections of slides. 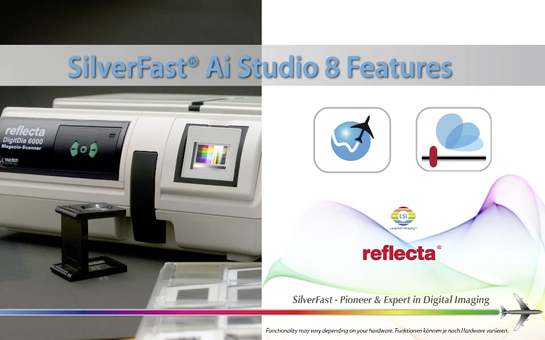 This video explains the benefits of scanner software SilverFast 8 compared to the reflecta CyberView X software in use with the latest reflecta scanners. Select your reflecta model to obtain scanner-specific information. Download demos and updates, check compatibility and prices. Our movies will introduce all SilverFast highlights and advantages to you, quick and easy to understand. Below you can directly select some movies showing the most important SilverFast features. Thanks to its unique features and highlights SilverFast has become world standard for scanner software. A majority of these features is patented and protected by trademark law. For questions or problems regarding SilverFast and reflecta scanners, please refer to the support overview page, which provides a variety of useful links, like our reflecta forum, the general FAQ and the current system requirements. SilverFast's 64bit HDRi format contains all readable image information along with the data of the infrared channel. 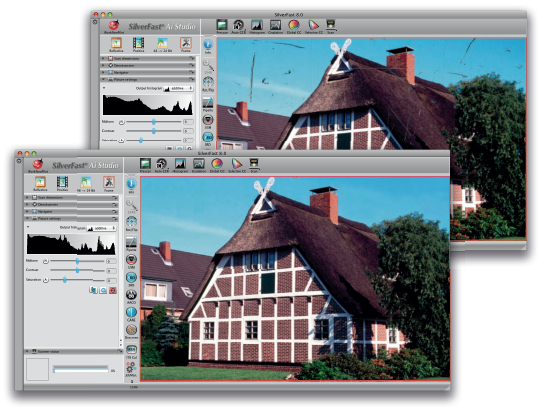 For a perfect HDRi workflow, we recommend the SilverFast Archive Suite for your reflecta scanner. Every scanner manufacturer provides an own scanner software for its devices. Usually, these software solutions are not as powerful as SilverFast. Therefore, we compare for you. Test results are available below. Kodachrome slides are particularly difficult to digitize, the scans often show a blue cast. Using a reflecta scanner with SilverFast, you obtain perfect scans. Even SRD and iSRD can be applied. What do reflecta users say about SilverFast? Thanks to our special Kodachrome profiles for our reflecta software you have three major advantages compared to usual software that let you finally scan your Kodachrome slides in high quality: maximum Dynamic Range, IT8 calibration and free of dust and scratches. Scanning Kodachromes with attention to recording the complete dynamic range is a considerable challenge. This, because the dynamic range reaches up to 3.8D - which is a grayscale range of 6300 shades and equals a contrast range of 1:6300! Fortunately SilverFast Multi-Exposure can handle the enormous dynamic range with film scanners. This guarantees reproduction of the deepest shades inside Kodachromes successfully. If you scan Kodachromes without IT8 calibration, the scans will consistently show a strong blue cast. Using SilverFast, the user simply goes to the general panel in SilverFast's main control dialog selects "Kodachrome" from the Pos./Neg. pop-up menu. SilverFast now applies a Kodachrome profile, which is specifically adjusted for your reflecta scanner. The blue cast is removed from the image! Dynamic Range is the most important factor for high quality scans, and a higher Dynamic Range ensures significantly better scans. Better scans means more visible details in highlights and shadows as a result of higher Dynamic Range. SilverFast Multi-Exposure® increases the Dynamic Range of the reflecta DigitDia 5000 from 2.98D (without ME) to 3.75D (with ME). This increase shows that the scanner can see more levels of gray, an increase from 955 levels to 5.623 levels of gray (based on ISO Standard 21550*). That is a remarkable difference! * Report of Institute of Image Engineering, Frechen here. Kodachromes scans can present an unsurmountable challenge due to the exceptional high density of the unique film material. Kodachromes can have a density of 3.8D - which equates to 6300 levels of gray or a contrast ratio of 1:6300! 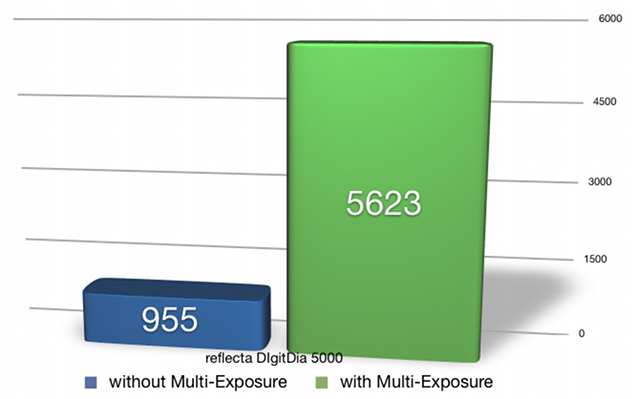 Due to our patented SilverFast Multi-Exposure technology our software helps reflecta scanners to acquire the huge Dynamic Range almost completely. This ensures that no shadow details become lost in Kodachromes. * Note: Scanning silver halide black and white films with iSRD® can produce artifacts in your pictures. In such cases it is recommended to use the software-based SRD® technology. Black and white chromogenic films developed with C-41 should not present any issues with iSRD®.